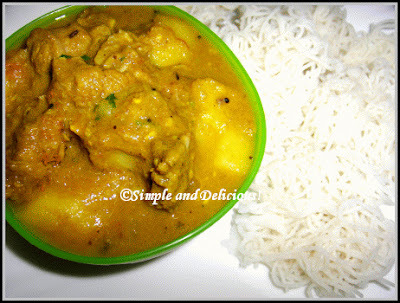 Mutton Potato Gravy | Simple and Delicious ! Peel the potatoes. Cut in to big pieces. Crush green chilly. Heat oil, splutter mustard seeds, cumin and fenugreek seeds.Add chopped onion and saute till transparent. Saute garlic,ginger paste. curry leaves and crushed green chilly in this. Add salt, all powders and tomatoes. Stir and add mutton and potatoes. Stir for a while till the masalas coat mutton and potatoes. After that pour 1 cup water into this. Mix, close the lid and cook on a medium heat. Cook till the mutton is tender. Open the lid, mix with coriander leaves. Keep it for an hour, then it would be thick. Love the mutton curry. Only time when i eat them is when i am back in India, here we don't get mutton which i think is a realy pity. Hey seena, this used to be a "sthiram" dish on sundays for lunch. Being so far away from home, I really miss those days. your curry looks yummy :)!! A plate for me? Seena, hi, have posted some info for you in the comments section of my latest post. This curry is a big favourite of mine. I can't stress on how delicious this looks! I have one question, though. Can I substitute lamb for this recipe? Since mutton is hard to find here? Let me know! Thanks! Seena the curry looks delicious. Its been ages since I had mutton. Actually we use Indian goat meat and we haven't classified it as lamb or mutton. We just ask for Indian mutton. I think you get lamb which is the young sheep , about one year old. For that mutton has some smell and we couldn't use. So You can cook mutton dishes here using lamb. I think choosing thigh part would be better. Hi. Tried this recipe and it came up superb. Big thanks! Thanks a lot, Umm Maryam! hi seena...this is moushumi again from bahrain....i tried this curry today for lunch....but i missed out a huge thing...i missed putting even a single tomato.wonder how it will taste....u think it will taste just what u want to convey??? let me know...i will report back to you the comments i get today..hahahahha..a huge thanks to you for ur gr888 recipes.